After the bells have chimed, the gifts have been opened, and the honeymoon suitcases have been unpacked, newlywed couples often find themselves wondering, “So, what’s for dinner?” That’s why chef James Briscione and his wife, writer Brooke Parkhurst, put together Just Married and Cooking—a guide to living, eating, and entertaining together. Divided into two sections—“Life As We Know It” and “New Traditions”—Just Married and Cooking is full of valuable advice, easy-to-master techniques, time-saving secrets, and most important, recipes for delicious dishes. In “Life As We Know It,” Brooke and James offer over a hundred recipes for everyday eating. From delectable morning muffins to after-work appetizers and easy-to-prepare dinners, this section has everything young couples need for simple, healthy, and enticing eating. “New Traditions” contains nine menus to help newlyweds mark the special occasions in their new lives together: a glamorous birthday-girl dinner, a fresh and warm spring lunch, a derby-day party complete with a recipe for fail-proof mint juleps, and much more. 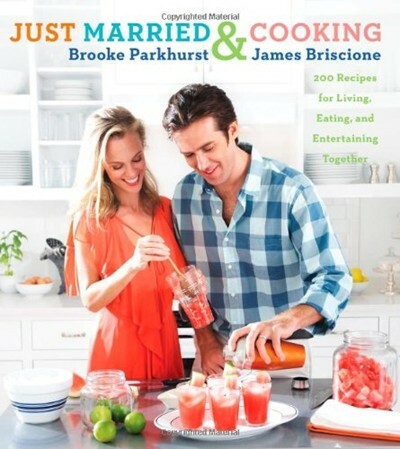 Including a wedding registry list, suggestions for how to keep a well-stocked pantry, a glossary of frequently used chef terms, and advice for how to plan ahead for easy entertaining, Just Married and Cooking is the cookbook newlywed couples everywhere will turn to time and again for recipes and help navigating the kitchen. A delectable new cookbook featuring delicious recipes made with fresh, seasonal ingredients and accompanied by entertaining, informative tips and techniques. Brooke Parkhurst and James Briscione, the newlywed team that teaches popular couples cooking classes at New York’s Institute of Culinary Education and The Culinary Cooperative, navigate the difficulties of a small kitchen, budgetary restrictions, and limited time. Whether readers are looking to prepare everyday meals or special-occasion feasts, Just Married and Cooking is an appealing, practical lifestyle guide for cooking couples everywhere.